These four thank-you-note-writing tips will help you create that personalized touch that every donor deserves. After your fundraiser has ended, your work is not completely done. Writing sincere and personalized thank you notes is extremely important. Not only does it reflect well upon you as a polite and caring person, but it will attract donors to come back for your next fundraising event and maybe even be more generous next time. Creating authentic relationships with your donors is important, even well after your efforts have ended. These four thank-you-note-writing tips will help you create that personalized touch that every donor deserves. 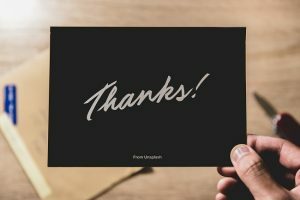 There’s no such thing as a thank you note that doesn’t include the phrase “thank you.” Not only is it important to choose a card that says thank you on the front, but your gratitude should be sprinkled throughout your note. At the beginning of your note, you should start with the phrase “thank you” or some other combination of words letting your donors know how much you appreciate their contribution toward your fundraiser. It’s best to get as specific as possible. Beginning your note with “Dear Donor” is not going to cut it. These donors of yours made your fundraiser a success so the least you could do is make each note personalized with the name of each donor. When thanking a specific donor for his or her contribution, it is also best to specify the amount which they donated. In this way, your donors will know that you took the time to recognize their efforts, which will make them feel good. In the final paragraph or the last few lines of your note, you want to be as sincerely thankful as possible. It’s also a great idea to include where this donor’s money is going specifically and how it will benefit your efforts in the near and/or far future. Don’t forget to sign your note with an actual, pen-written signature. This little detail provides a much more personalized touch than you can imagine. This entry was posted on Friday, May 18th, 2018 at 9:56 am. Both comments and pings are currently closed.